Yesterday MyHandsomeHusband came home from a work meeting with a little package of breadsticks from The Olive Garden. If only you could have heard the response from my kids! I wish I could marry those breadstickkkkkkkks! Get out of my way…they are miiiiiiiinnnnnneeee! if you could have been a little bird outside my kitchen window. And so….since we take our 5 children to the Olive Garden, like…never. I took pity on them. 1. Turn your tap water to hot. It should feel hot, but not so hot that it’s uncomfortable to touch. 2. Fill up your handy measuring device with 1 1/2 C hot water. 3. Pour the water into your stand mixer. Add the sugar. 5. Add the softened butter. 6. Pour in about 2 cups of flour. 7. Using the paddle handle start to mix the dough on low. 9. Add the rest of the flour about a half cup at a time, until the dough scrapes the sides of the bowl clean. 10. Mix the dough for 5 minutes on medium speed. See how the dough looks nice and elastic-ey. Ok…maybe it’s a little hard to see! And who know if elastic-ey is even a word! If you were to touch it, it should spring back just a bit. That is what you want! 11. Spray your counter top and your hands with cooking spray. Take the dough out of the mixing bowl and roll it into a long log on your counter top. 12. Spray a sharp knife with cooking spray and cut the dough into 12-14 pieces. You can see that I cut it into 12 here….I actually ended up cutting parts off some of the bigger pieces and ended up with 14 breadsticks total. 13. Roll the pieces into long snakes. “Whoa.” you might be thinking. “That looks like some kind of Pinocchio length breadstick, or somethin!” Don’t worry. Once you set them in the pan, they will shrink a bit. It will work out well for you if you roll them out long….Pinocchio long. 14. Spray 2 large cookie sheets with cooking spray, and lay the breadsticks out leaving about 2 inches between each one. 15. Place the pans in your oven with the temperature turned to 170. Let them rise for about 15 minutes, or until doubled in size. 16. Once the breadsticks have risen, remove them from the oven. Brush them with the 1 1/2 T of the melted butter and sprinkle them with the sea salt. 17. Return them to the oven and turn the heat to 400 degrees. Your dough will rise a bit more as the oven temperature increases. Once it has hit 400 degrees the breadsticks should cook for about 12 -15 minutes, or until golden brown. Half way thought the baking period open up your oven and switch the bottom pan to the top, and the top to the bottom. This will ensure they cook evenly. 18. While the breadsticks are baking combine the rest of the melted butter with 1/4 t garlic powder. 19. When the breadsticks are golden brown, remove them from the oven and brush them with the melted butter/garlic mixture. That’s it! Serve these babies hot from the oven. You won’t regret it! 1. Turn your tap water to hot. It should feel hot, but not so hot that it's uncomfortable to touch. 10. Mix the dough for 5 minutes on medium speed. See how the dough looks nice and elastic-ey. Ok...maybe it's a little hard to see! 12. Spray a sharp knife with cooking spray and cut the dough into 12-14 pieces. You can see that I cut it into 12 here....I actually ended up cutting parts off some of the bigger pieces and ended up with 14 breadsticks total. 13. Roll the pieces into long snakes. "Whoa." you might be thinking. "That looks like some kind of Pinocchio length breadstick, or somethin!" Don't worry. Once you set them in the pan, they will shrink a bit. It will work out well for you if you roll them out long....Pinocchio long. 19. When the breadsticks are golden brown, remove them from the oven and brush them with the melted butter/garlic mixture. That's it! Serve these babies hot from the oven. You won't regret it! Just want to say thanks for all the great recipes! I know when I get one from here it will be good because you have tried it!! 🙂 I can't tell you how much we enjoy them. Congrats to the cookbook winners! Lucky people! Thanks for the recipe. Tomorrow is Lasagna day so these will be perfect. Pure genius!! I love Olive Garden bread sticks (so do my children when I kindly bring the spares home). At our house eating out with everyone in tow pretty much consists of all you can eat buffets (my teens and preteen, okay, all of them are bottomless pits). Anyway, I can't wait to whip up a batch very, very soon! MMMM! This look great. I will make them tonight. Thanks for sharing. YUM! I rarely eat at the Olive Garden, but I do love their breadsticks!! You are amazing! I jusy joined your blog and fb page and I am so excited to get trying these new recipes. thanks for making such an awesome blog. My husband LOVES Sweetwater. They do tours Fri/Sat. $8 for a cup and 6 drink tkecits not too shabby! They just expanded, so it will be nice to see what they have in store for the spring. I'm not a big fan of the Olive Garden, but I'll go just to have about a dozen of those breadsticks!! NOM NOM. Congrats to the winners of the OBB cookbooks!! Awesome! I'm so excited! (About the cookbook AND the breadsticks!) Where should I send you my info? Just made them….fresh and hot!!! YUMMMY! I love all your bread recipes! Found your blog through another blog just today. WOW and YUMMY are the first words that come to mind! Then well done, excellent how to's and I will be back again and again comes to mind next! Thanks SO much for the cookbook. I have been wanting it for a long time!! I am so so excited!!! 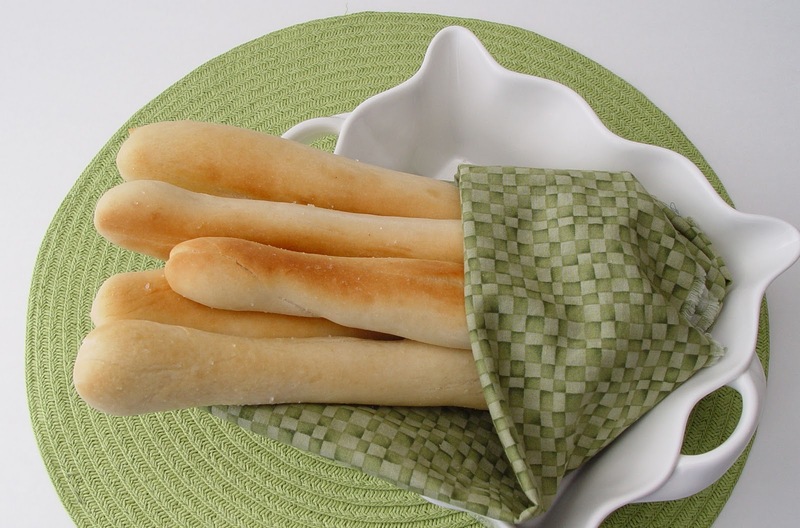 Also, I will be trying the breadstick recipe!! YUM!!! We love Olive Garden and we love breadsticks! Can't wait to make these…. They are rising now. Beautiful. And oh, so simple. Kneaded by hand cause I don't have a stand mixer (yet!… one day!!!). I'm salivating already. It's the first day of soup season here, so we will have them with homemade cream of roasted portabella mushrooms with marsala. Can't wait. Jamie, I have said this before and will say it again. You make me look so good. We had the bishop and his family over for dinner and I made these for the first time. EVERYBODY loved them and I am very proud of myself also. I can’t believe how good they taste and how much they taste like the Olive Gardens coming from MY kitchen. My bread sticks were a huge hit. Thanks again. I have tried this recipe several times now. Each time they don’t really rose, no matter how long I give them. I know my yeast is good because I make liks of other dough fine, but these just won’t cooperate. Any ideas? 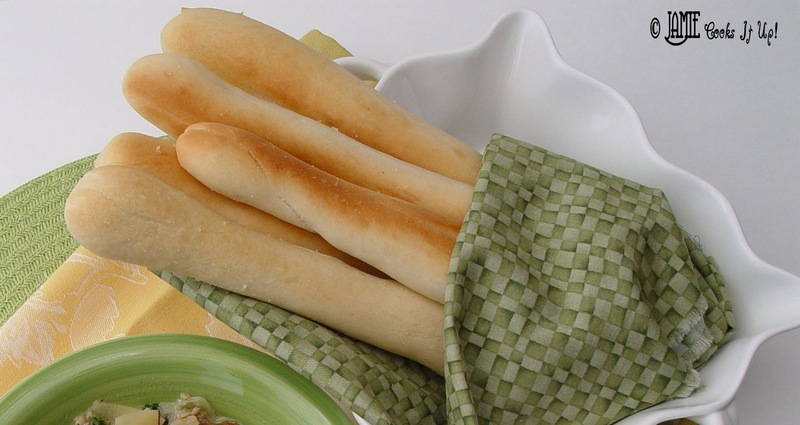 Sometimes depending on the temperature of your house or the weather outside these breadsticks can be temperamental. If you have had trouble with them rising a couple of times before I would go ahead and add just a bit more yeast. I bet that will help a lot. Good luck! Hope they turn out better for you the next time.